Iconic small stool in solid wood. Considered a design classic, the ST04 Backenzahn (german for molar) has become an identifying icon for e15 and part of several permanent exhibitions in museums. 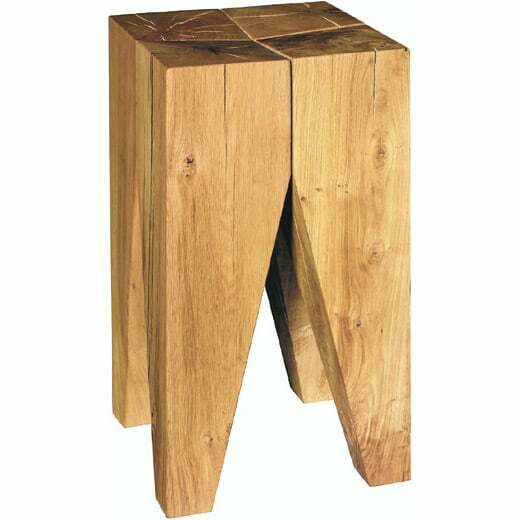 The four identical legs made of solid wood give character to the stool. The legs taper downward with two deliberate incisions. The gaps between the legs suggest that all four parts are still clearly recognizable, and the slightly concave seat provides seating comfort. This piece can also be supplied with a flat top to be used as a side table. Do you have a question about "Backenzahn ST04"? How can we contact you?